If the second GOP presidential debate turns out to be anything like the first one back on Aug. 6, then I do believe we're all in for a pretty memorable night of television. And by the looks of things, the producers and network execs behind the telecast have their bets on that happening, considering they've pulled out all the stops creating the perfect backdrop. I mean, CNN's parked a plane on the GOP debate stage. That's right, a plane! 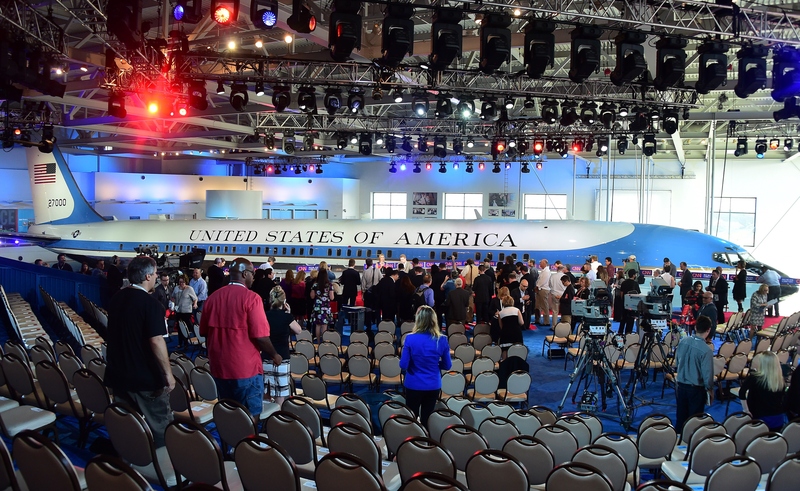 And it isn't just any old plane, either; it's Ronald Reagan's Air Force One, and it'll be sitting right smack-dab behind the stage at the Reagan Library, where all 11 Republican candidates will be debating Wednesday night. But as for the official word on why CNN chose a plane for its backdrop? Um ... Because it's cool, guys. Just go with it. So yeah, in case you were thinking that CNN went out and made themselves their own mock Air Force One in advance, not quite. Though that's not to say the network hasn't been spending major cash on the event or the campaign in general. According to multiple sources, CNN has beefed up their political reporting staff in recent months to take on the election year with full force. And not just a little bit, either. While the Hollywood Reporter claimed the number of new political staffers to be around 40 back in February, the Huffington Post now reports it's ballooned to 100 — all poached from outlets ranging from The Wall Street Journal to The New York Times. CNN's pretty sure that their money's in the right place, though. As Feist told The Washington Post earlier this year, a big story calls for some big bucks. "This is the biggest story we know of that we’ll be covering in the next two years," said Feist. "We’ll spend more money on the 2016 campaign than on any campaign in history." That's probably why the network has made no bones about majorly up-charging ad spots during the debate. According to Advertising Age, CNN is reportedly charging 40 times more than their average price. As for the total each advertiser will have to pony up? That comes out to a cool $200,000 — for a mere 30 seconds of precious air time. Yikes. But hey, when you figure the ratings they'll likely pull in, it's no wonder. Just consider the first debate, broadcast by Fox News and (rather infamously) moderated by Megyn Kelly. That racked in some 24 million viewers — a number that actually broke records. In fact, according to The New York Times, it was the highest-rated presidential primary debate ever. It was also one of the most-viewed events in cable TV history. And if you're struggling to remember why, I've got two words for you: Donald. Trump. Yep — even if most of the candidates standing up on stage don't bring their A-game tonight, there's one guy who will certainly keep things entertaining, and it's the Donald. Love him or hate him, the networks know he makes for some pretty entertaining television — and you can bet debate moderators Jake Tapper and Dana Bash are more than ready for him.